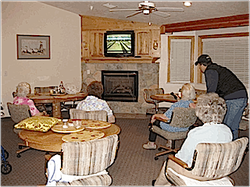 Golden Skyline Assisted living believes that just because you get older doesn’t mean social activities should end. That’s why we offer social activities where residents can interact with other residents as well as the community. Residents can enjoy stimulating and fun activities to keep their minds active, alive and feeling young. We also believe in the old adage “a body in motion tends to stay in motion”. Therefore we offer daily physical exercise activities to keep the body flexible and invigorated. Golden Skyline Assisted Living also believes in uplifting the soul. We work with local places of worship to provide weekly in house religious services and activities offering spiritual enriching for the heart, mind and soul. Residents work on fun challenging activities that help to keep the mind active. Fun times for kids of all ages. It doesn’t matter whether you’re 8 or 80. 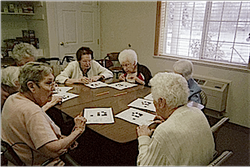 Residents enjoy playing new and exciting game with families and friends. Although it looks like fun; residents are energetic competitors working hard to win prizes.